Comparison to the Grand Canyon of the Colorado fails to do justice to the Copper Canyon of Mexicos remote Sierra Tarahumara. A breathtaking V-shape fissure through rugged mountains, the Copper Canyon (actually four canyons) is deeper than the Grand Canyon and longer. Along with awe-inspiring scenery, travelers see a dramatic contrast of climate zones ranging from alpine peaks to tropical bottom lands where bananas and papayas grow. The canyon is home to a fascinating array of cultures, including the Tarahumara Indians (called "the runners"), German-speaking Mennonites, and Mexican copper miners. Threading the canyon is an engineering marvel, the Chihuahua al Pacifico railroad while a road system reaching beyond El Divisadero permits us to offer side tours and sightseeing. Halintours and Texas Bus Travel Service now make the journey easy with departure from Austin by deluxe bus direct to Chihuahua. You have time to see two different views of the canyon with sightseeing by bus on the way down and direct service by first class train on the way back to Chihuahua. Day 1. Board your comfortable motor coach in Austin for drive to Chihuahua. Cross the border at Presidio and arrive in Chihuahua in time for supper. Overnight Hotel Palacio del Sol. Day 2. Board coach after breakfast for drive to Creel. Stop in Cuauhtemoc. Side trip to Mennonite colony. Arrive in Creel at 1:30 PM. After lunch tour to Arareco Lake, Cusarare Indian Town and Cusarare Falls. Overnight Best Western the Lodge at Creel. Day 3. After breakfast continue on your bus to Divisadero and Barrancas, visiting Pitoreal, the little town of writers, painters, and poets. Six miles ahead you will see the "Fertility Rock" (no men allowed.) Arrive in Divisadero in mid morning for two different views of the Copper Canyon, then continue to Barrancas for lunch. Afternoon free to explore the area. Overnight El Mirador Posada and El Rancho. Lunch & dinner included. Day 4. Breakfast at hotel included. Morning free to explore this interesting area until 11 AM when you return to Divisadero and board the first-class train for El Fuerte. 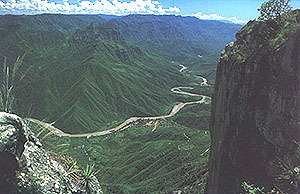 Ahead is the most scenic part of the tour, the dramatic chasm of the Copper Canyon. Train is equipped with dining room, bar, and restrooms. Arrive at El Fuerte and transfer to Hotel Posada del Hidalgo. Evening walking tour. Day 5. 7 AM check out and transfer to train station. Today you return through the Copper Canyon with the light opposite to that of your journey down the canyon. Arrive Chihuahua at 9:30 PM and transfer to Hotel Palacio del Sol. Day 6. After breakfast board your bus for Austin. You will be home from your adventure by early evening. 2005 price to be announced. Bus transportation from Austin to Chihuahua to Divisadero and return from Chihuahua to Austin, First Class "CHEPE" train from Divisadero to El Fuerte and El Fuerte to Chihuahua, tours in Divisadero and Creel. First class hotels in Chihuahua at the Palacio del Sol, Creel at the Best Western Hotel the Lodge of Creel, Divisadero (Barranca) at Hotel El Mirador Posada (meals included), and El Fuerte at Posada del Hidalgo. Not included are any services not specified in the itinerary description, gratuities (except for bell boys), local and long distance calls, meals except in Divisadero..